In 2014, 78 human mushroom poisonings, four of them fatal, were reported either on the NAMA website or to NAMA toxicology committee members. The four fatalities were the consequence of ingestion of either Amanita phalloides or Amanita ocreata (both are in subgenus section Phalloideae). Other notable cases this past year included a 1-year-old hallucinating and then nearly dying after consuming an Inocybe species containing indoles (and not muscarine) as the toxins. We received word of four cats poisoned by mushrooms, including one cat that died from ingestion of Amanita ocreata. Reports of cats poisoned by mushrooms are very unusual. A large number of dogs died from mushroom ingestion, especially in California. We received 39 reports of dogs poisoned by fungi with 15 deaths. The fungi involved in dog deaths were mostly Amanita mushrooms in section Phalloideae, though a Scleroderma species caused a pair of dog deaths. Mushrooms that caused one reported dog death each were Amanita cokeri, Gyromitra esculenta, an Inocybe species, and possibly Lepiota subincarnata. In one dog death, a Xerula species was the only mushroom found in the yard. Some years, no human deaths are reported to NAMA from mushroom poisoning—2014 was an unusually bad year with four deaths due to ingestion of Amanita phalloides or Amanita ocreata or another member of Amanita section Phalloideae. 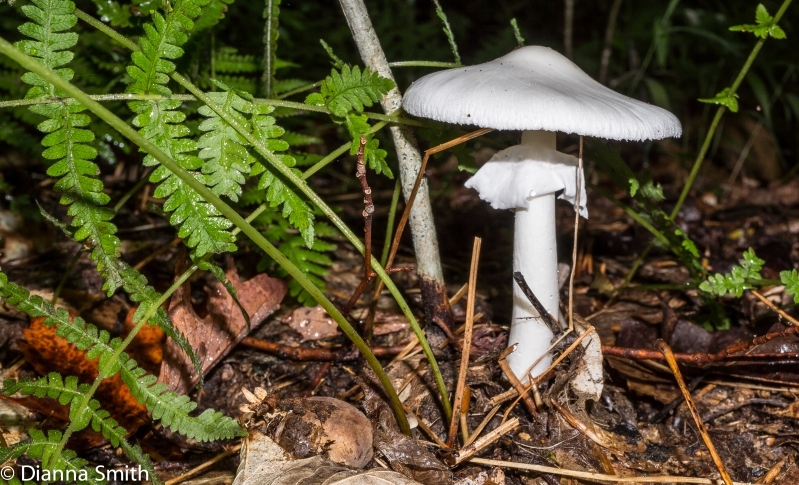 In one mystery-shrouded case, a 53-year-old male from Michigan suffered classical delayed-onset amatoxin symptoms and died 3 days after consuming what we presume was an Amanita. The only mushroom found later in the area was an unidentifiable Agaricus species. The man picked and ate mushrooms on a Saturday; he felt ill on Sunday but did nothing about it. On Monday, he called his wife at work and asked her to take him to the hospital. She reportedly came home to find him dead. It is unclear whether there was an autopsy, which might have revealed classic liver damage and blood thinning had it been an actual amatoxin case. It is surprising that death occurred so rapidly if it was indeed amatoxins. In a California case, a man’s death was attributed to Amanita phalloides based on symptoms: He was ill for several days before going to the hospital, at which point his liver was already completely necrosed. There was no time for a liver transplant. In another delayed treatment case, a man from British Columbia consumed Amanita phalloides in California and returned home to Vancouver, British Columbia. At some unknown time, he went to a Vancouver hospital where he died. We have no details on the dates, the number of days in hospital, or the treatment. A fourth death, reported in the news in California, involved a 31-year-old male in a mental ward who picked and quickly consumed an Amanita ocreata growing on the grounds. He fell ill 24 hours later and died after being taken off life support on day four of treatment. We have no information on the treatment protocol. The case was complicated by miscommunication among all parties involved with trying to determine what had happened. There is no reason to believe that allenic norleucine was involved. A sensitive quantitative assay of multiple fruiting bodies of the species that was ingested from the original collecting site (on the property of one of the affected men) produced no evidence of allenic norleucine. Zip, zilch. Here is the story that I put together after interviewing the hospital staff, the patients and their relatives, and New Jersey Poison Information and Education System. Two men ingested a single grilled mushroom; they arrived at the emergency room after a long delay before the onset of symptoms. They presented symptoms consistent with amatoxin poisoning except for the lack of strongly elevated (liver) enzyme levels. When later blood work was done, it was discovered that the man who had ingested by far the larger part of the mushroom was suffering kidney damage (not complete shutdown). It was discovered after some confusion that this man had a history of kidney problems. The man who ate the smaller amount of the mushroom never manifested kidney difficulties. After the typical amatoxin symptoms, the “false recovery” set in for both men. I was quite worried when one of the men left the hospital. He was convinced to return. However, the symptoms never returned. Both men became and remained asymptomatic and were eventually released. I identified the mushroom morphologically and molecularly as a species that has killed people in New Jersey in the past. Given the placeholder name Amanita sp-O-01 (“O-zero-one,” where the “O” is for Ohio), this undescribed mushroom has been known to me for some time and has been collected in Ohio by Walt Sturgeon for decades. It is positive in reaction to KOH. It is relatively robust for its size (medium to small). Apparently, the concentration of amatoxins in the fruiting body can vary considerably. In a previous fatal case in which I was involved, the person who died had eaten multiple portions of a delicious (I am told) mushroom curry containing only sp-O-01. In addition to the four documented deaths, Marilyn Shaw reported a mysterious death of a teenager attempting to get high. The youth had gone out and returned well after midnight, “thrashing around, apparently hallucinating.” The father could not get through to his son, so he left him, only to find his son dead four hours later. While no cause of death could be determined and drug panels turned up negative, a plastic bag of dried mushroom material was found and brought to Denver, Colorado, by an assistant in a Colorado coroner’s office. Marilyn Shaw and Vera Evenson could make out small pieces that appeared to be Amanita muscaria in the bag. There is no evidence that mushrooms were consumed in the fatal incident, but it is possible. However, even if mushrooms had been consumed, the toxins muscimol and ibotenic acid are not lethal toxins (unless consumed in extraordinarily large amount). Even then, they would not cause death so rapidly except in a case of shock (because of an allergic reaction). In a Washington state case, a teen presented at the hospital with severe gastrointestinal symptoms. It was presumed that he had eaten Galerina marginata, a deadly species containing amatoxins. Brandon Matheny later sequenced the mushrooms and found that they were Gymnopilus penetrans (Joe Ammirati, personal communication). Several Gymnopilus species do contain enough psilocybin and psilocin to be hallucinogenic. They do not contain amatoxins but may very well contain other uncharacterized toxins. In a New Mexico case, a 1-year-old ate a fair amount of what was clearly a species of Inocybe. She appeared to be hallucinating, was agitated, and required intubation. She had a fever in excess of 104°F, went into a coma, and had a seizure. She did not have any symptoms of muscarinic poisoning. The child’s mother sampled the same mushrooms and felt strange as a result. While most species of Inocybe contain high levels of the toxin muscarine, a few Inocybe species are high in the indoles psilocybin and psilocin. These indoles, present in many species in the genus Psilocybe, have previously caused death in very young children. Given the child’s temperature, we can assume that this was a narrow escape on death. It is worth noting that wild mushrooms of any kind are not advisable for children under the age of 5 or 6. Their immune systems are not yet fully developed, and they are both more severely affected by toxic mushrooms than healthy adults are and can be sickened by mushrooms that are edible for adults. We have reports regarding six young men who wound up in the hospital while attempting to get high on what was presumed by Poison Center personnel to be Psilocybe species. Such events are far more common than indicated by the six reports that we received; neither hospitals nor Poison Centers release information due to privacy issues or time constraints. In two other cases—one in South Carolina and the other in Washington state—20- to 30-year-old men who knew nothing about mushrooms had picked little brown mushrooms in the woods hoping to get high. Both men suffered adverse effects for weeks, writing repeatedly to several different NAMA toxicology identifiers and fearing that they had eaten something that was going to kill them days or weeks later. The Washington state man had eaten Gymnopus peronatus. We could not tell with any certainty what the South Carolina man had eaten. In both cases, the ongoing symptoms were possibly the result of fear and panic, rather than any toxin inherent to the mushrooms. Marilyn Shaw also had a case where she concluded that ongoing symptoms described by a caller were probably panic attacks after a person consumed mushrooms as food without carefully identifying them first. Chlorophyllum molybdites was behind more of the poisoning reports than any other species. It is common in warm, humid areas (or well-watered lawns in warm climates). It is the most common poisonous lawn mushroom and is frequently sampled raw, an unwise practice with any mushroom, wild or cultivated. The taste is great, but it can cause vomiting, diarrhea, and intestinal cramps lasting for many hours, and its ingestion may lead to bloody diarrhea and bloody sputum. Another group of tasty but poisonous mushrooms is Amanita subgenus Amanita section Amanita. This includes the Amanita muscaria group and the Amanita pantherina group. In six reports involving nine individuals, people consumed mushrooms containing the isoxazole compounds found in members of Amanita section Amanita. All but one of four people who consumed Amanita pantherina as food wound up hospitalized and in a coma. One case involved a 91-year-old female who became comatose after consuming a large meal of Amanita pantherina. Another involved a couple who consumed about one-half pound of Amanita pantherina. We have three reports involving six individuals who became sick after consuming Leccinum species. Four of those individuals from two 2014 cases consumed raw or only lightly cooked mushrooms. It is increasingly clear that if you do choose to eat a Leccinum, you should cook it thoroughly. In addition, it is unwise to eat a very large meal of Leccinum, as one couple learned after they consumed 12 to 15 cooked buttons. Shiitake mushrooms were involved in several cases of both GI upset and severe rash. Lentinula edodes, shiitake, must be thoroughly cooked. It is important to note that in May 2014 researchers reported finding high inorganic arsenic levels in shiitake products, including fresh mushrooms, food supplements, and canned and dried shiitake. Moderate consumption of shiitake is not a concern, but regular consumption could pose a threat of arsenic poisoning. In one case, a chef purchased “ceps” and Lepista nuda “blewits” from a forager. Even though the forager warned the chef to cook the blewits, the chef consumed one raw, a fact that he did not initially own up to since he was so embarrassed over his poor judgment. The price the chef paid was initial flushing, sweating, vomiting, nausea, and blurred vision followed by a return bout of vomiting 14 hours later. On follow-up, he was very chastened and resolved to be much more conservative in his future consumption of mushrooms (Greg Marley personal communication). It is also clear that raw or undercooked morels can cause vomiting and diarrhea, as at least one person rediscovered last year. Two other people suffered extreme drowsiness immediately after consuming cooked yellow morels, followed by vertigo when they awoke hours later. One of the two also began vomiting on awakening. It is not clear how well-cooked those morels were. Gyromitra esculenta, sometimes known as “beefsteaks,” continues to be widely consumed, especially in Michigan. Even well-cooked Gyromitra esculenta can cause severe, even life-threatening poisoning. One man from British Columbia, a lifelong forager who was not in great health, was hospitalized for one month after a meal of Gyromitra esculenta. Rapid hepatic and renal failure and then a colonic ischemia followed his initial nausea and vomiting. Doctors had presumed it was a case of amatoxin poisoning. In a Michigan case, a 75-year-old man in poor initial health who had eaten a large meal of beefsteaks for two days in a row, presented at the ER with elevated transaminases and bilirubin as well as diarrhea, dizziness, intestinal cramps, vomiting, nausea, and headache. Four days later, he was still very jaundiced and his urine was dark red. In another case, three teenagers out camping picked a five-gallon bucket of Gyromitra esculenta, cooked up a big pot of the mushrooms, and “ate a lot.” For two, diarrhea and vomiting followed. The third suffered chills, flushing, and headache in addition to nausea and vomiting. The next morning their dog found the pot of cooked mushrooms and, like many a dog, pigged out. After suffering vomiting and diarrhea for two days, the dog became dehydrated and its temperature climbed to 102.4°F. A veterinarian treated the dog for two days, and the dog died on day four. In the past year, two different women—in two separate instances—cooked and consumed Clitocybe dealbata, a mushroom that contains significant levels of muscarine. They suffered excessive salivation, sweating, chills, and vomiting. One woman had mistaken her collection for blewits, which she had eaten for years. The other woman had mistaken her mushrooms for “box elder” mushrooms, which she had eaten for years. Both swore that they would be more careful in the future. Even with edible mushrooms, moderation can be important. If you have a somewhat adverse reaction to a species and you continue to eat it, your next reaction can be worse. One couple consumed Verpa bohemica several days in a row. The woman eventually developed diarrhea, and the man became woozy. Another man reported that chanterelles normally increased his visual acuity, nightmares, and sensitivity to cold. However, in that man’s most recent experience, in addition to his usual reactions, he had extreme hypertension (300-plus/180). He does not plan to eat chanterelles again. Another woman had felt unwell after her first meal of chanterelles. Her second meal was much worse, resulting in vomiting and diarrhea. Cats are considered obligate carnivores, and it is very rare to get a report of even one cat poisoned by mushrooms. However, this year three individuals reported four cats who fell sick after consuming wild mushrooms. A California case involved a sick cat that died at the veterinarian’s office. The owner found a partially eaten Amanita ocreata under the dining room table. The cat had brought its prize into the house, as cats tend to do. A second case involved a cat from semiarid eastern Washington. After periods of heavy rain, what appeared from photos to be Coprinopsis atramentaria variety crassivelata would start to form underground where a huge poplar tree had once grown. The cat would dig out the mushrooms, eat them, act crazy, and vomit. Even though the owner tried to preemptively remove the mushrooms, the cat would detect them before they broke the soil surface. The third cat poisoning case involved two sick feral cats from Nova Scotia. The person who submitted the report engaged an animal communicator, who relayed to the owner that the cats said that they loved to eat mushrooms but this time the mushrooms had made them ill. The reported symptoms were reminiscent of Amanita muscaria poisoning. The person who submitted the report hesitated for fear of being considered a bit crazy. I will leave any conclusion to your judgment. It is also unusual, but not unheard of, to get a report of a horse eating mushrooms. This year’s case involved a horse that appeared to be hallucinating in a Montana pasture. On the sescond day of its strange behavior, the horse was lying down and could not get up for quite a while. The owner would not let the veterinarian euthanize the horse. The owner, a medical doctor, had observed an abundance of little brown mushrooms in the grass and on manure, with blue staining on some mushrooms, so she suspected they were hallucinogenic mushrooms (the species involved may have been in the genus Panaeolus). She consulted with Marilyn Shaw who confirmed the suspicions. The horse recovered with no lasting problems. Many more veterinarians are now aware of NAMA, and we are getting better information about animal poisonings. As usual, dogs dominated the animal poisoning cases. In many cases dogs died after consuming wild mushrooms. For the first time ever, there was a report of a dog that died after consuming what very much appeared to be Amanita cokeri. Amanita cokeri was once suspected of containing the toxin allenic norleucine, but it actually contains other toxins yet to be described. Another dog was acting “stoned” and had diarrhea, then became lethargic and soon died. The mushroom found in the yard was a white Xerula species. However, there is no direct evidence linking the presence of the Xerula to the dog poisoning. Indeed, we simply do not know whether some Xerula species are toxic. Amanita phalloides and Amanita ocreata dominated the dog death reports, with six reports of eight dogs dead in California from ingesting these mushrooms. Newspaper reports, mainly in the Marin Independent Journal repeatedly warned dog owners to look out for Amanita phalloides and Amanita ocreata, which mainly grow under oaks, though both species have been found under other hardwoods and Amanita phalloides has been found under conifers. The news articles caution owners to remove the mushrooms as soon as they are spotted because they seem irresistible to some dogs. One article told owners to pick the mushrooms without being seen by the dogs since seeing owners picking the mushrooms can pique the dogs’ interest. That is good advice. The articles also made it clear to us that the six reports we received represented only a small fraction of the dogs that died in California last year. Reporters also pointed out that larger dogs could sometimes be saved by prompt and aggressive treatment focusing on rehydration. However, with small dogs, even prompt treatment could not save many animals. While the cause of a dog’s death often remains a mystery, we learned that the University of California, Davis, is now testing dog urine for amatoxins as well as doing tissue postmortems. Thus, at least for California, veterinarians now can confirm whether amatoxins were present. Ingestion of a Scleroderma species claimed the lives of two Yorkies in California. Scleroderma species are involved in human and animal poisonings nearly every year. While no human deaths have been recorded from Scleroderma species, they have killed both dogs and pigs. Inocybe species are also known to be potentially lethal to dogs, but so far not to humans. In 2014, at least one dog died from ingesting an Inocybe. The picture of the Inocybe looked somewhat similar to Inocybe lanuginosa, but the spores were smooth, not nodulose, so we do not know what the actual species was. In another incident, two dogs died from amatoxin-like symptoms, but no Amanita species were found in the yard. However, the pictures included what appeared to be Lepiota subincarnata, a species known to contain amatoxins. With dogs, it is always a challenge figuring out what they actually consumed unless the mushrooms are found in the stomach contents or vomitus or mushrooms are found partially eaten. teen ? Father could not get through to son who was "thrashing around, apparently hallucinating." Son found dead four hours later. 31 24 Vomiting after consuming one mushroom raw. Taken off life support, and died on day four. No treatment details. 54 8? Diarrhea, dizziness, vomiting, drowsiness, nausea, and weakness. Days of severely elevated liver enzymes. Recovered with fluid therapies, no IV silibinin. Adult ? Presented at emergency room after several days of illness, liver already completely necrosed. Died. Adult ? Patient with amatoxin symptoms. Silibinin obtained but not used. Patient recovered after a few days. Adult ? A patient in a Vancouver, BC, hospital became ill after returning from vacation. Died. No details of treatment. MI M, 53 12+ Diarrhea, vomiting. Felt unwell 7/17. Wife was called on 7/18 to take him to hospital. She found him dead at home 7/18. Adult ?14 Two men consumed one grilled mushroom. Recovered.
? 16 The mushrooms were marinated in vinegar and oil and eaten cooked or raw or both. Excessive stomach bloating, pain in upper-right quadrant. Ill for days. IV fluids and anti-nausea medicines administered at the hospital. 73 ? Vomiting and stomach cramping, “feeling funny in the head” for about 10 hours. 35 1 Swelling of the tongue on two occasions. Previously eaten without adverse effect. 2 not ill Promptly hospitalized and given charcoal. Vomited and discharged. WA ? ? Call from Poison Center about poisoning. No details. 74 5 Dizzy from mushrooms cooked in butter. 50, ? 2 2 victims consumed up to one-half pound raw for food. Diarrhea, intestinal cramps, vomiting, drowsiness, confusion, unequal pupil size, roving eye movement, and coma. Sedated and intubated. Adult 1 10 mushrooms cooked by Russian immigrant. Ate similar mushrooms in Russia. Hallucinations, disorientation, drowsiness, nausea, facial swelling, and hypertension. Eventually obtunded. 91 6 Eaten for food. Drowsy, then troubled breathing, later comatose and intubated.
? 2 “Stomach rolling.” Caller feared Amanita smithiana. ? ? Man in mushroom class ill from eating “honey mushrooms,” dropped class. 50 <1 Extreme hypertension (300+/180). Increased visual acuity, cold intolerance, and nightmares. Says all but hypertension are his normal reaction to chanterelles. He will not eat these again. 51 ? Vomiting and diarrhea. Patient recalled feeling unwell after previous chanterelle meal. 39, 45 2 Consumed raw and cooked in soup. Vomiting, coagulation up slightly in one. Given Zofran. 36, 52 <1 Picked in grass and cooked. Nausea, vomiting. 57, ? 1 Vomiting pieces of mushroom (eaten raw?) from garden. 64 2.5 Cooked one “shaggy mane.” Vomiting. 22 1-2 Vomiting, diarrhea and stomach cramps lasting over six hours after six to seven bites cooked. Others ate one piece each and did not fall ill.
5 2+? Vomiting after one piece eaten raw. Mushroom from lawn. 7 4 One entire small mushroom eaten raw. Diarrhea, intestinal cramps, nausea, weakness, headache, two hours of severe dry heaving. Treated with IV hydration and antiemetics. 8 ? One eaten day one. Two eaten second day led to nausea, sweating, and bloody sputum. 32 0.5 Vomiting, diarrhea, and abdominal cramps after eating small piece raw. 71 1 Chills, salivation, sweating, drowsiness, sneezing, and runny nose. Had gathered blewits in her yard for years. 60 1 Chills, diarrhea, excessive salivation, intestinal cramps, profuse sweating, vomiting lasting five hours. ? ? Flushing and tachycardia call from poison control. 17 5 GI symptoms. Initially thought to be Galerina marginata poisoning, and the patient was given charcoal and silibinin with liver and kidney monitoring.
? 20 ? 1 Naive collector believed the mushroom to be a Psilocybe. He had panic attacks after consuming it. Increased heart rate and sweaty, forced vomiting followed by many days feeling unwell until assured mushrooms not very toxic.
? 4-6 Nausea and vomiting stabilized with fluids and morphine, but rapid hepatic and renal failure and colonic ischemia followed. Hospitalized one month. Poor underlying condition. meal Consumed 8 to 12 ounces two days in a row. Patient had numerous other medical issues. Presented with elevated transaminases and bilirubin, diarrhea, dizziness, intestinal cramps, vomiting, nausea, and headache. Noted jaundice and dark red urine four days after. 66 3 Husband and wife ate one-quarter cup. Husband was not affected. Wife had dizziness, intestinal cramps, sweating, nausea. Slept 10 hours, took effervescent antacid and felt worse for one hour. Mom, ? ? A 1-year-old ate a fair amount and appeared agitated, possibly hallucinating. The child required intubation. Fever over 104°F, coma, seizure. Pupils normal, no hypersalivation, vomiting, or diarrhea. Mother tasted them later, had onset of feeling strange. 47 0.75 Salivation, dizziness, vomiting, and nausea after eating four very small slices cooked. Duration: three hours. 38, ? 12 Vomiting and diarrhea after two people ate 12 to 15 small cooked buttons. 2 Children The family ate these mushrooms, all dried, in a stew prepared one week before the incident. 1st child vomited for seven hours. Three hours later, the second child and the mom also became ill.
52 6-10 Diarrhea, salivation, intestinal cramps, vomiting, drowsiness, nausea, and weakness after one small bite raw. 54 48 Eaten in a frozen stir-fry mix. Rash.
? 0.25 Felt strange, then had nausea and chills, vomiting after one-half hour, then dry heaves, coughing, and diarrhea. Felt weak the following day. 45 0.5 Cooked and left in fridge five days before consumption. Urge to vomit, strong diarrhea and intense intestinal cramps.
? <0.25 Two eaten in a Chinese restaurant dish. Two other mushroom species in dish were not eaten. Chills, dizziness, intestinal cramps, sweating, nausea, weakness, headache, difficulty breathing, blurred vision, and tingling pins and needles. NE Child 1.5 Vomited after ingesting a small piece. Given activated charcoal at hospital and observed for 48 hours in case it was an Amanita. 38 3.5 Diarrhea (four times), vomiting (one time), and felt unwell for more than 16 hours after eating a quarter-size piece sauteed. Adult, Child 0.5 Both immediately tired and slept for several hours, then two family members experienced vertigo, and the father suffered vomiting. 64 3 Vomiting and diarrhea after adding two 1-inch pieces of dry morel to a stew and reheating. Greg Marley ID’d from photo. 45, 47 ? 2 Intestinal cramps, vomiting (lasting 7½ hours), nausea, weakness (lasting one week in the female), and bloated feeling. 57 6-10 Cooked two large helpings and had two martinis. Fever 101°F, chills, extreme diarrhea, vomiting then dry heaves, stomach and intestinal cramps, sweating, nausea lasting 36 hours. Two sons ate heartily but were not affected. 20, ? ? Hallucinations, tachycardia, mydriasis, and dry mucous membranes. Given Ativan. 50 ? Hallucinations and agitation. Treated with Ativan and IV fluids. 23 ? Drowsiness and bradycardia. 17 ? Muscle spasms, hypertonia (spasticity), and delayed stiffness. Given Valium and Ativan. 23 ? Three to 4 grams eaten raw. Flushing and hallucinations. No treatment. Adult ? 2 mushrooms eaten raw. Drowsiness and nausea. Given IV fluids. 26 4 Mushrooms were cleaned then stored in the refrigerator for three days. One to 2 ounces were cooked and eaten with alcohol. Chills, diarrhea, intestinal cramps, vomiting, nausea, and weakness. 62 72 Rash followed by horrible itching within five days. Shiitake dermatitis suspected. ?50 0.75 A small amount of the cep as well as the Lepista nuda were eaten raw. Flushing, sweating, vomiting, nausea, and blurred vision. Given Compazine to control nausea. Vomiting returned after 12 to 14 hours and lasted several hours. teen ? “Acting weird.” Stepfather called the police. 15 1.5-2 Diarrhea, intestinal cramps, vomiting, nausea, tachycardia, mild hypotension, and prolonged PT/INR, and elevated bilirubin. teen? ? Multitude of complaints continuing for five weeks until T. Cotter and M. W. Beug finally convinced the teen he was not going to die. WA Cat <1 Cat digs up mushrooms, eats them, acts crazy, and then vomits. Arid area. Poisoning repeated after every heavy rain. Scotia 2 Cats (feral) <24 Refusal of all food, most water, and periods of disoriented wandering, sitting stupefied, and sleeping heavily. Other cat vomiting. 1.5 12-16 Diarrhea, salivation, intestinal cramps, disorientation, vomiting, nausea, weakness, and death. MD Dog ? One of three at veterinarian with serious toxicity, recovered. NC Dog ? Diarrhea, vomiting, and drowsiness. Given antibiotics at veterinarian. Died. MI Dog 1 Diarrhea, salivation, vomiting, and nausea. OH Dog ? Presented with drooling, ataxic respiration, unequal pupil size, and disorientation as if blind. One liver enzyme elevated. NY Dog ? Veterinarian induced vomiting and pushed IV fluids. OH 2 Dogs ? Both dogs drooling, acting sick, and stumbling. One was kept at the veterinarian’s for 24 hours; the other was less sick. CO Dog ? Central nervous system problems erroneously attributed by vet as a stroke. 2, 6, ?, ? ? Two show Newfoundlands died, and two show Shiba Inus survived. Salivation, vomiting, and nausea. Eventual fever, increased heart rate in dogs that bled out and died. Necropsy reports found liver failure. Amatoxins in urine. Amanita phalloides or Amanita ocreata probable. CA Dog, 9 weeks 8+ Diarrhea, vomiting, nausea, weakness, elevated liver enzymes, and low blood sugar levels. Aggressive fluids plus plasma. Death. CA Dog ? Puppy trembling after a nap. Stomach clogged with undigested food. Vomited and then seemed normal. Coma next day. Died day three of complete liver and kidney failure. Amatoxins detected. 9 <24 Vomiting, lethargy. Liver enzymes 6,500 IU/L. Death. Amatoxins in urine. CA Dog ? Veterinarian treatments failed. Dog died. Mushroom under walnut tree, not oaks. MD Dog ? This dog was one of three at the same veterinarian with serious toxicity. No details. All recovered. WA Dog ? Puppy vomited after consuming mushrooms. Liver levels normal. MD Dog 1 Six-kilogram Maltese presented with vomiting, bradycardia, and bloody diarrhea. TX Dog ? Acute hepatic failure but responded to treatment and survived. CA Dog ? Puppy in critical care at the veterinarian. MI Dog 12 Dog consumed a large amount from a pot of cooked mushrooms left on the ground. Vomiting and diarrhea. Two days later, dehydrated, temperature 102.4°F, painful abdomen, blood in eye, dark mucous membranes, and unable to stand. Died day four. MD Dog ? Dog (a Spaniel) died within 24 hours. Inocybe spores found in vomitus. AR 2 Dogs, 11 years and 12 weeks ? Fever, salivation, dizziness, intestinal cramps, disorientation, vomiting of mushrooms, drowsiness, nausea, weakness, blood clotting disorder, and liver failure. Death of both dogs despite extensive treatment with IV fluids, etc. WA Dog ? Vomiting and diarrhea for over 16 hours. MI Dog 1 Fever 105°F, diarrhea, and vomiting. CA 2 Dogs ? Diarrhea, intestinal cramps, vomiting, and fever followed by seizures. Supportive care. Both Yorkies died. MD Dog 4 Dog vomited large quantity of mushrooms. Owner gave H2O2. More vomiting, then bright yellow diarrhea. Veterinarian gave activated charcoal and IV fluids. 7 <1 Vomited dog food (vomitus smelled of mushrooms) and had diarrhea. Soon lethargic and acted “stoned.” Died. MT Horse ? Horse appeared to be hallucinating. Pasture had many little brown mushrooms.